Civilians living under Israeli occupation in the besieged Gaza Strip face a greater risk to their lives in the wake of a recent shift in Israel’s “military rules of engagement,” a new study warns. In a report released on Tuesday, British NGO Action on Armed Violence (AOAV) said theIsrael Defense Force’s (IDF) use of artillery on Palestinians is characterized by a“wide gap between public rhetoric and reality on the ground.”The NGO warned Gazan civilians face a greater risk of death from Israeli“artillery shelling”than they did prior to 2005. As part of its research, AOAV examined regulations dictating where the IDF have deployed explosive weapons since 2005. While Israel withdrew its ground troops from Gaza in 2005, the IDF’s air, land and sea blockade of the coastal strip remains steadfast. 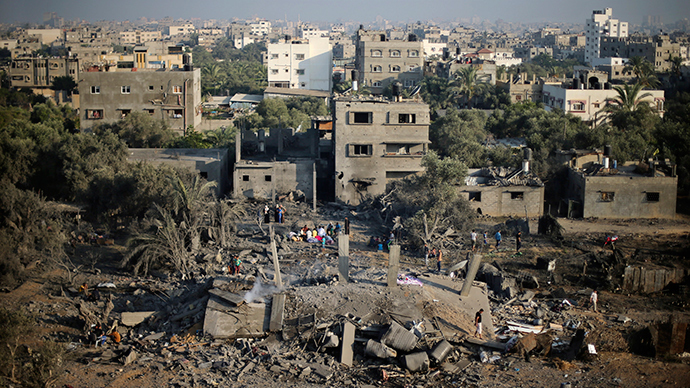 AOAV’s research, ‘Under Fire’, examined suggestions made by Israeli officials that the IDF have greatly improved the protection of Palestinian civilians from the effects of Israel's explosive artillery. Because these explosive weapons lack accuracy, they require particularly robust rules to protect civilians from unintentional ‘collateral damage,’ AOAV says. The NGO'sreport reveals that rather than decreasing the risk of civilian deaths from Israeli explosive weapons, the IDF’s rules regulating such practices have been relaxed since 2005.As a result, Gazan civilians face a greater risk of dying from Israeli artillery shelling than they did nine years ago, AOAV said. Director of Policy at AOAV, Iain Overton, stressed unguided artillery shells are a “relic of a bygone day.”He said there is no reason to prevent the IDF from scrapping its use of such dangerous and destructive weaponry in civilian populated areas. AOAV’s research found 2014 was characterized by the IDF's heaviest use of“high-explosive artillery shells”in eight years.Despite Israel’s investment in alternatives to the artillery it traditionally used, a minimum of 34,000“unguided shells”were fired into Gaza last year, AOAV said.This marks an increase on the number of unguided artillery shells launched in any IDF military campaign since the Lebanon War of 2006, it added. AOAV’s report revealed the IDF launched almost five and a half times as many“high explosive artillery shells”during its military assault on Gaza in 2014 as it did during its military offensive against Gaza in 2008/09.It added the IDF has dramatically reduced the distance that regulates how close artillery shells can land to residential homes in recent years. While this distance stood at 300 meters in 2005, the IDF shortened it to 100 meters in 2006. The NGO's report concluded the only policy to have yielded a clear improvement in the rate of civilian deaths in Gaza was a temporary suspension on artillery shelling implemented by Israel in December 2006. After 2008, however, this measure was scrapped. “In recent years the IDF has shifted away from using other devastating weapons like multiple rocket launchers or globally-banned cluster bombs,” Robert Perkins, Senior Researcher at AOAV, said.